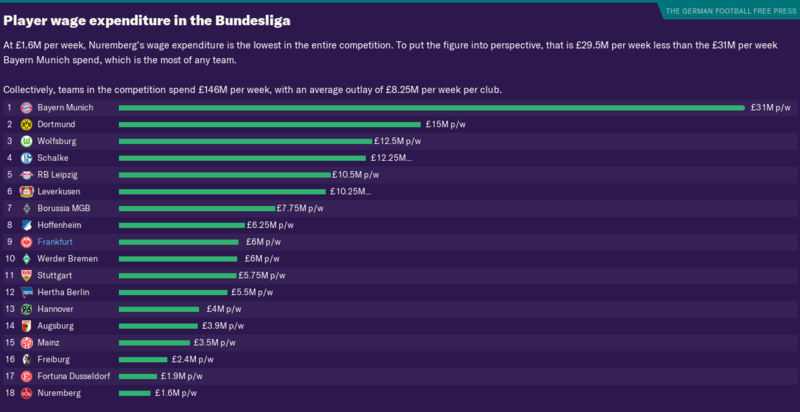 Welcome to my first season with Eintracht Frankfurt! Last time, I went through a bit of history and some aims. Now it’s time to get stuck in to the save proper. I’ve been playing a lot (although as usual, not quickly), so we’re going to plow through the first four months of the season. 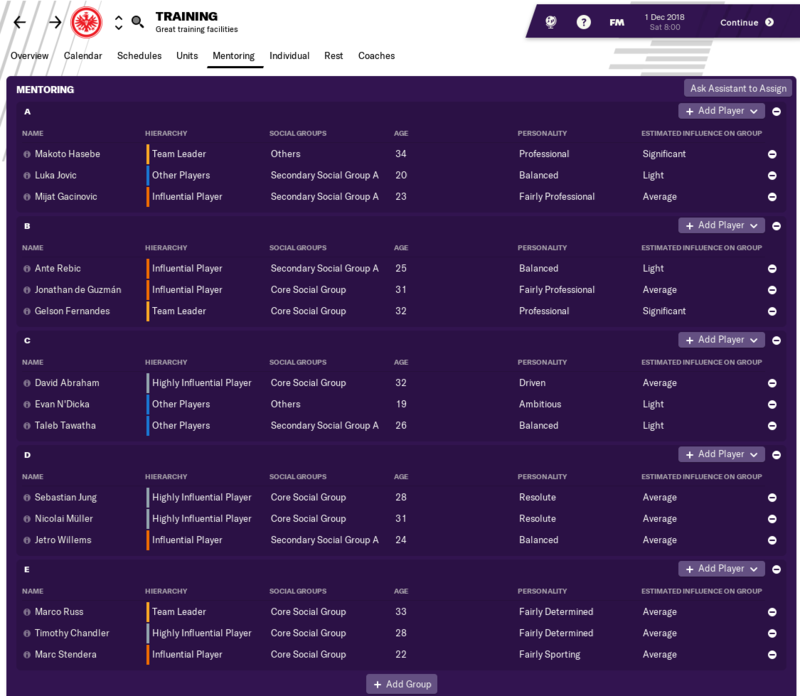 I’ll go through the normal save update stuff, but also touch on some of the new features in FM19, and how I’m getting on with them so far. 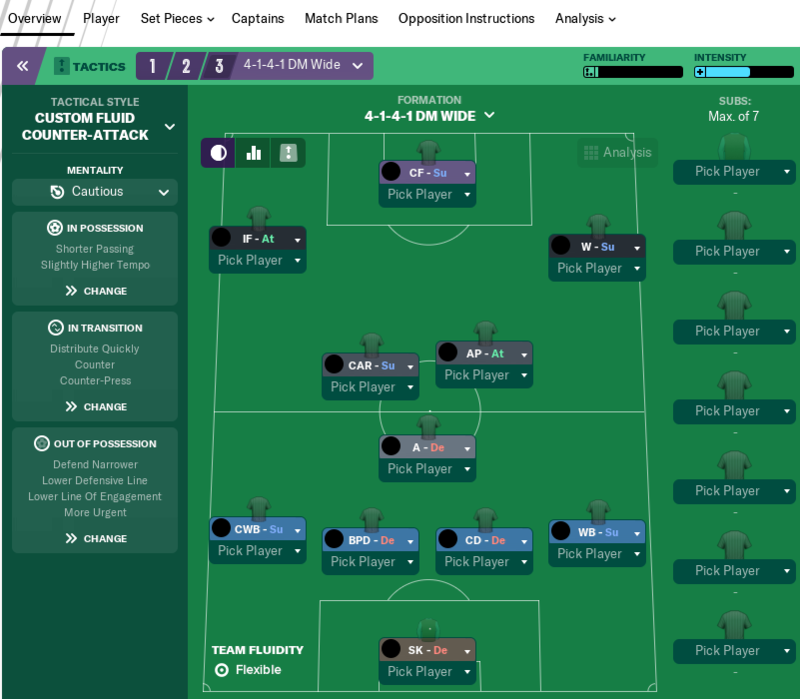 Here’s a very quick review: FM19 is great, I love it. The training overhaul is the most intimidating change. To start with, I left it in my assistant manager’s hands, so as not to screw up our pre-season fitness preparation. But as time’s gone on, I’ve become more hands-on. I think he may have been slightly under working the squad, as red arrows were a common sight for the first couple of months, despite everyone training well. So firstly, I added my own ideas for individual training, and applied those as usual. Next I begun tweaking what the assistant was doing, particularly adding a bit of team bonding and set piece training (areas he seemed to be neglecting). The final step will be to create my own week-long schedules. I feel like I’ve got more of a grasp on it after seeing what my assistant has done, and my intention is to take over fully during part three. We’ll see if that works out better. This took me no time at all to get used to. I realised early on that the way I intend on playing this season doesn’t really match any of the new pre-sets, so I didn’t use them for this season’s tactics, starting from scratch instead. Breaking the team instructions into sections based on who has the ball really cleans things up, and seems to make the whole thing more intuitive. Having team fluidity change based on the roles selected is also a welcome change. Big fan. And I like the purple too. We don’t necessarily need a 6th CB, but with two of our five likely to be leaving at the end of the season, I bought Jack O’Connell in. He looks a promising, well rounded player and a year of our training and settling in to Germany seems like a good idea. Gino Peruzzi came in as the right back we needed and he looks a decent squad rotation guy. Although I then noticed that we were a home grown player short for Europe. A look at the market only revealed one option: Sebastian Jung, another right back. We added him too, as he was cheap, and a superior option in Europe than a youth player. The other two incoming players are loanees that will provide cover. Jovane Cabral will provide it for our other light spot (right wing), whilst Eddie Nketiah comes in just in case of an injury crisis up top. In terms of outgoings, I didn’t have much luck drumming up interest. Gonçalo Paciência goes out on loan as no-one would buy him, in fact only one player did get interest, Marco Fabián returning to Mexico. Neither player is bad, but both lack some of the key attributes I want (Technique, Composure, Decisions, Determination, Pace), and the squad is too big. I’m skipping pre-season talk, other than to say we battered a load of dross. Other than Uerdingen who just wouldn’t concede. One game, one trophy! We beat Bayern in a tight, attritional game, with neither side showing much quality. We really ground out these results, but a 100% start is great to see. Our defence-first tactic seems to have started well, as have many of our -ic’s. It’s a challenging group, but not insurmountable. Regular winners Sevilla are sure to be favourites, but I fancy our chances of getting through in second. Our performance against RB Leipzig was fantastic. We were the best version of my tactical aims – creating quality chances, clinical in the finish and solid at the back against an impressive opponent. Scoring three goals from corners this month is another example of our Concordian playing style doing the job. The fixture list has been kind to us here, and we took full advantage. But three good performances in between. Coming from behind against a Schalke side stronger than their league position suggests, was particularly pleasing. And FM19 makes me even uglier than FM18 did. 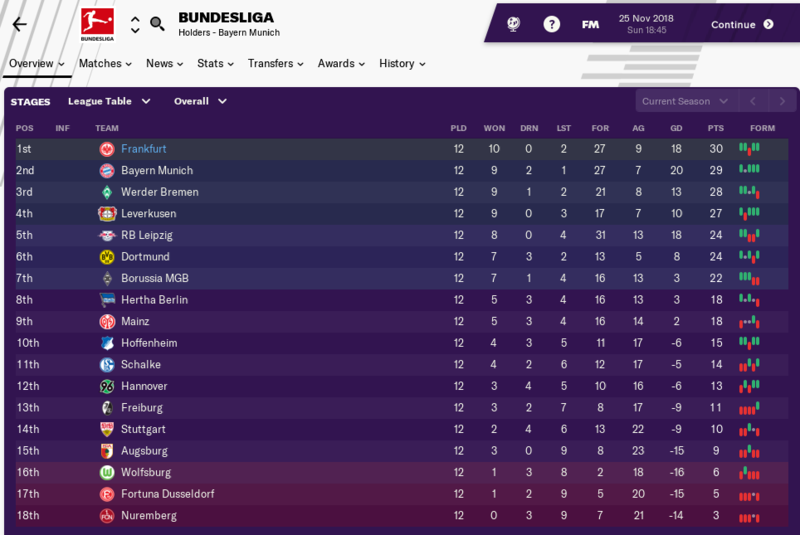 With matches against Bayern, Leverkusen and the derby against Mainz coming up, I expect top spot won’t be ours for much longer. But it’s been a surprisingly good start. As a team we’re performing well, though curiously, outside of Kevin Trapp in goal, no player other than Nicolai Müller (a goal and six assists from the right wing) has really performed consistently enough to cement a first team spot. It’s very strange for a side that sits atop the league. And it’s why I haven’t included many details on players. Everyone has been alright, but no-one stands apart in any particular category. I don’t really want to list a whole bunch of stats. In Part Three, I pray that I can make some progress toward establishing some semblance of order in this squad. Attempting to keep everyone happy is impossible and irritating. A settled side should also be good for team performance in theory, although that’s one area that seems to be going incredibly well so far.